In early 2009, I was a fairly new fan of Congressman Ron Paul, having learned of him during the 2008 presidential election. You can imagine my excitement when I heard that his son, Rand Paul, was thinking of running for the U.S. Senate. When I found out he would be representing Kentucky – my home state – it was that much more invigorating. I knew immediately that I would do everything I could in my local community to raise support for Rand. Luke Welch is a conservative in politics. He has a master’s degree from Covenant Seminary and preaches regularly in a conservative Anglican church in Maryland. He blogs about Bible structure at SUBTEXT. Anyone who reads or writes for this blog may be interested in the upcoming publication of Ron Paul’s newest book, New School Manifesto. Ron Charles at the Washington Post Blog reports that it will be released on September 17, 2013, getting Paul’s post-congressional career off to a fruitful and visible start. We here at the KC are not necessarily categorically insistent on homeschooling, but we are insistent on Christian education, which necessarily means education freely decided on by parents and not by governing entities. Near the end of the first video Rand also talks about keeping government out of religious institutions as a guard to the freedom to call things “sinful.” This, of couse, applies to schools as well as to churches. Keep an eye on this man as 2016 floats off in the distance. For a number of years now, I have gone around criticizing federal programs of Republicans, and federal programs of Democrats as if they were burning down our economy. I have sneered at what I thought was nonsensical, wanton, or even devious. But I have been confronted with a basic error in interpreting the events in our country. As I look back, I am afraid my own mouth has been used to promote falsehoods. “So also the tongue is a small member, yet it boasts of great things. How great a forest is set ablaze by such a small fire!” I have prompted others to think as I did. I am sorry. I must use that same mouth to show what I should have seen. Don’t you see? A controlled burn to create a barrier – that is how you stop the flames from licking at your heels! When something really awful is coming for you – you have to do the awful thing too! You have to do it first! And a lot! That way you will be immune! That way you won’t feel it when it gets there. Take TARP for example. Back in my blindness, I would have told you that you can’t fix debt by adding on debt. They weren’t trying to make the debt larger! They were trying to make big, scary debt, right here, really fast…THAT way we would be really tired of debt and emotionally exhausted by it before it got here. Controlled burning, see!? They weren’t trying to conflagrate us, they were just controlling us. And that’s way better. You know for our own good. But you know how fires catch on like ideas, and it’s a good thing too, because the controlled burn has been a good solution. And this style of burning the people has caught on everywhere. Which means they’ll probably be able to control more and more. And we can let them save us and won’t have to worry or fret or think anymore. Cheer up, you may think it isn’t widespread, but there are tons of areas they can burn us in. It’s going to be a wildfire! Take domestic terrorism. It could be here at any moment. Out of 330 million people who are potential criminals, a good handful of us has already worked on doing domestic terror on our very own land. Will the raging fire of domestic terror get here first? NO, the government is already here at the scene of the future crime, and they aren’t merely getting ready to act. They have already started! They are fast at work, patting us down, and recording what we own, downloading our computer data, and taking photos with flying robot assassins. These robots could even get their own piece of the action. Don’t worry. Domestic terrorists may have flesh and blood, but they probably also have feelings, so these robots have an advantage – no analytical emotion to get in the way of triggering “fighting fire with fire!” Domestic future bad guys, prepare to be terrorized by the experts. Prepare to be put out of business by our corner on the market. Consider violence against women. We can certainly round up the cash to pay for more Planned violence against women. Consider elections – one sure fire way to get rid of current bad candidates is to put more bad candidates on the roster before they can hurt us with the bad candidates we already have. Their waging an immeasurable war against us? We’ll wage an immeasurable war against them, whoever they are! Unconstitutional legislation threatening us? We can throw a little unconstitutional court ruling at it! Learn controlled safety at home. This thing is just jumping from roof to roof now! Control the burn! Control the people! Control the fear! If we all work together as one, there will be nothing we cannot accomplish! Look, you don’t have to wait for the government to help you. You can get involved. You can, in your own small way, wage war against the coming debt crisis! You can immunize yourself to the wave of debt by making big, painful debt as close as your own pocket. Your own kids can know debt today, and be free from pain in the future. So, I am sorry that I have suggested voting for candidates of small and principled followings. I am sorry that I pretended that fiscal responsibility meant fiscal restraint. I am sorry that I called for friends to investigate candidates who said “sound economic principles” were wise. I recognize how alone and wrong I was, now that I see the brilliance that both of our upstanding parties have shared. Just how many candidates want sound economic principles, anyway? Three? Two? One? And what is the sound of one economic principle clapping anyway? Exactly. If a tree burns in the woods, and no one is there to control it… you had better believe it’s burning toward your house. And before it gets there – you know who to call. 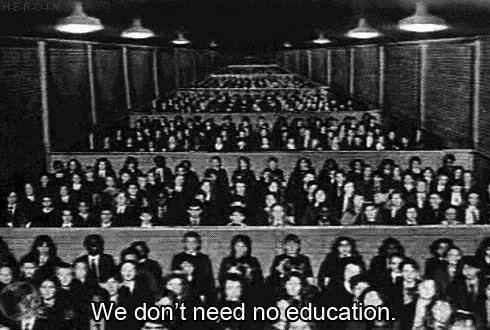 Pink Floyd’s monumental contribution to the world is found in this statement: “We don’t need no education!” Despite the political and psychedelic observation, our country needs a lot more education of the right kind. One of my greatest desires over the years has been to educate–imperfectly–friends and family on the virtues of the American view. I am under no compulsion to defend the perfection of the U.S. Constitution. I happen to believe that Patrick Henry’s skepticism is now well justified. At the same time, I am committed to the fact that we must use the tools that we have to fight the present intellectual war. At this stage in American history, Christians have an important duty to educate the public by inculcating a form of transcendent morality. Politicians will not take this to be their main tasks. By and large they are concerned about their constituents’ response to their decisions and votes. This adds an immense amount of burden to politicians. They need greater burdens, but not the temptation to act even more unwisely. Naturally, I find this to be at least one reason for the vast inconsistencies we find in most of their voting records. Term limits, anyone? As Republicans re-group, they are beginning to re-fill their savings for 2014. After suffering a loss of two seats in the Senate and a handful in the House, they are wondering what to do to restore those seats. Is Constitutional education part of this reformation process in their minds? It is certainly not. Out of the many tools, I believe the labors of the Institute on the Constitution could add tremendously to the general knowledge. Democrats are ideological in nature. They are seeking and proposing strategies that will genuinely change the make-up of the country–for the worse, we might add. But on the other hand, ideological Republicans are ridiculed. The reason for this–as Steve Deace observes–is that Republicans are seeking to control the party and not the country. When politicians propose tough transformations to the play-book, they are viewed as radicals. What role will Christians have in these next four years? Will we continue to seek another moderate candidate? Are Republican talking heads correct when they assert that we need an even more moderate leaning Republican candidate to reach the independent groups? Or will we pursue to train and participate in local elections and conversations, and thus influence the grassroots? Will we tap into this gigantic Tea Party and Constitutional storm that is brewing? One thing is certain: Our political investments need to be in education, not enriching political consultants. Nothing puzzled me more than when conservatives kept insisting that Mitt Romney was a pro-life candidate for president. Many voters cast their ballot for Romney last week because of the abortion issue alone. Likewise, many Americans – including Christians – didn’t vote for Romney because of the abortion issue alone. Not because they are pro-choice, but because they don’t believe Romney is truly pro-life. It is an undeniable fact that Mitt Romney has been on both sides of the abortion debate throughout his career. Inconsistency is usually a good sign of not being trustworthy, but people can change their minds. For now, we’ll give him the benefit of the doubt. The official narrative we are given is that Romney converted to the pro-life position in 2004. Throughout the 2012 campaign, he has used the typical pro-life rhetoric to his advantage. His website even had a great section on protecting the unborn. So far, so good. One could easily conclude that his days of supporting legal abortion and funding Planned Parenthood are done and in the past. But what did he say in the months leading up to election night? Though not the best answer, it is consistent with a pro-life position. Let’s continue. That’s five total statements regarding abortion over the span of five weeks and only two of them are consistent with a pro-life position. That means his pro-abortion statements outweigh his anti-abortion statements. His two good statements aren’t even unique to the pro-life movement! Certainly, taxpayers shouldn’t be forced to fund abortions and Roe v. Wade should be overturned. But these ideals could just as well be uttered by a pro-choice constitutionalist. So, how should we interpret all of this? Romney’s stated views are not exclusively pro-life and he can’t offer us a constitutional argument. He defers all responsibility to the Supreme Court, ignoring that the Constitution gives Congress the power to strip jurisdiction from federal courts. A pro-life president could push Congress to pass personhood legislation, effectively overturning Roe v. Wade. But not Romney. There’s no abortion legislation on his agenda, remember? The Supreme Court will have to make their own decision, remember? Romney wants abortion to be legal, remember? He alluded to abortion being a valid form of contraception, remember? It makes one wonder what’s left for Romney to be “pro-life” about. There may have been legitimate reasons to vote for Romney last week. Unfortunately, pro-life activism wasn’t one of them.